First of all: an Easter Weekend in Berlin is probably not the best opportunity for shopping. Good Friday (German: “Karfreitag”) is more or less like a regular Sunday – which means that almost all shops are usually closed. You may find some late shops and Kiosks open. But don’t expect to go shopping on Good Friday. On Easter Saturday however all shops are open, as if it was a regular Saturday. Easter Sunday ‘everything’ is again closed – just like on a regular Sunday. And on Easter Monday again all shops are closed, just like on Good Friday an Easter Sunday. It seems like this routine is again and again a surprise for some people – and also for some grocery stores. I do remember going to the local supermarket on Easter Saturday just to find myself in an overcrowded shop with half empty shelves. So if you need to shop for groceries, you should probably already start to stock some basics a couple of days before Easter. So shopping on Easter can be a bit difficult. But there are of course many other options, many other things to do in Berlin on Easter Weekend. First of all: people love to go outside. Many people consider the Easter Weekend the first ‘real’ opportunity to enjoy a first glimpse of spring – or at least they want to check, if spring time has finally arrived. Or if at least Winter is gone. Some may meet with friends and/or family and go for an Easter Walk, others may meet in a park a let the children hunt for eggs and sweets and treats. Other just have dinners or go straight to the bar and/or clubbing. Even though Easter may not be a good time for shopping, there are some special ‘shopping opportunities throughout the Easter Weekend: Easter Markets and Flea Markets. 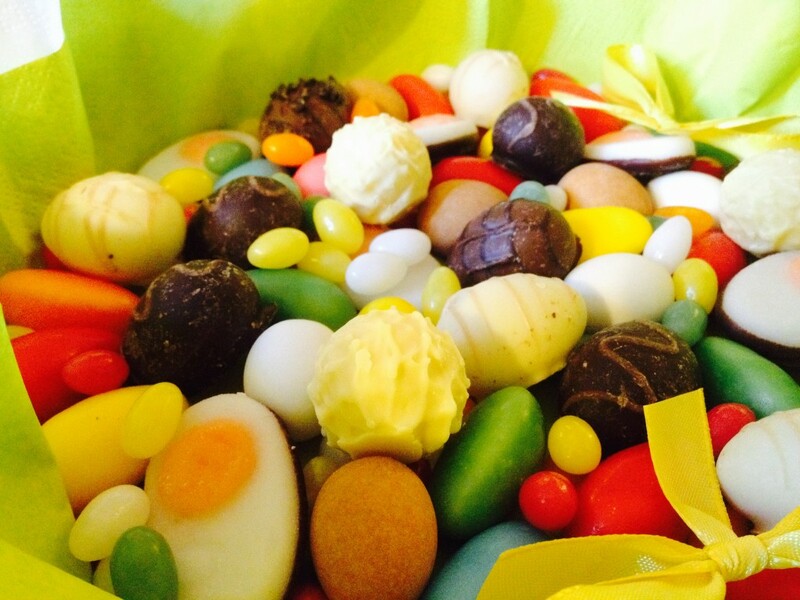 Easter has always been a traditional food celebration – for various different reasons. In Christian traditions Easter is mostly about celebrating the resurrection of Jesus Christ. And therefore it’s also the end of Lent / the Lenting season – the period of fasting. But as far as I know Easter has been about food and fertility long before Christian religion was established in Northern / Central Europe. For many people it’s common to have one or more ‘Easter Nests’ around the house. The Easter Nest is often a more or less colorful decorated basket or bowl, often padded with fake or real grass you can buy from flower shops, stuffed with colorful candy, chocolate and sweets of all kinds in some Easter shape: eggs, chicken, bunny rabbits, flowers etc. Since in Berlin and Germany the Easter Festivities are a lot about food, good food, lots of good food, most of the Cafés, Restaurants and Bars are open during the Easter Weekend. Some might even have special Easter Offers that you need to make a reservation for. On Easter Sunday and Monday Easter Brunch is a popular thing to do. You may also want to consider having a nice brunch at one of the many hotels in town. Again: you better check for availability in advance. What can I say about Decorating Eggs? Well – it’s probably the most popular Easter Custom in Germany. For Easter people love to decorate eggs. Eggs are painted in various colors, drawn on or patterns are scratched into the shell. Then the eggs are either hung from a tree or a bush placed in a basket or in a nest made of straw or napkins. And it’s great fun, too. For me the Easter Egg Hunting is probably the custom that I remember best from my childhood. Parents hide mostly sweets, candies, goodies and little toys either around the house, the garden or in a nearby park. Then the kids have to go on the Egg Hunt and find all the little treats the Easter Bunny has supposedly hidden for them. As far as I know most people go on the Easter Egg Hunt on Easter Saturday – but it seems to vary between family traditions. Considering the Egg Hunt, Easter in Berlin may be a bit different from Easter in other parts of Germany: since people lack a proper garden, the Egg Hunt is often ‘celebrated’ indoors – or in a nearby park. The Easter Fire is another important custom in lost areas around Germany. Mostly practiced in the country side it also made its way into the more rural neighborhoods – and there are actually also some public Easter Fires in Berlin you may attend. Thank you for a very useful post! Are restaurants usually open in Berlin during Easter? Thanks a heap! And happy Easter! Are Flohmarkt im Mauerpark open at easter (monday)? Considering going to Berlin during Easter 2018, so this was a very useful post. As I understand it, it’s actually only Friday that is affected? In Denmark, Thursday would also be a holiday, and everything closed. yes, in Berlin the Thursday is a regular day – but Friday AND Monday all shops are closed. However restaurants, bars, etc. are open. Are museums open in regular hours? Most museums will be open – but please check opening hours when you plan your visit because some museums may have different opening hours during the Easter Weekend. Some smaller museums may even be closed.